There is a one-story apartment building on Portion Road that is set right next to the shore of Lake Ronkonkoma. It looks like an old, 1950s motel: a dozen rooms, flat roof, rectangular in shape, built with cinderblocks, with a faded brick facing for show. The structure is about 10-feet high. I’ve passed the place hundreds of times, but never knew what it was. But now I saw it had a name. And a sign. “Lake Towers,” the sign said. I drove another 100 yards… and saw that the little trailer park next to the Lake was empty. A part of local history was gone and I hadn’t heard anything about it. I wanted some answers, so I turned my car around and stopped in at Parsnips, the bar between the one-story Lake Towers and the place where the trailer park used to be. I went inside, ordered a beer, and asked the bartender what had happened to the trailer park. He said the town moved the last of the occupants out a little while ago. I asked what the town planned to do with the empty lot. The bartender said the town was planning to build a walkway around the lake; they just had to get a few more structures out of the way. I asked him about Lake Towers next door. He said it was built in the 50s or 60s as “affordable housing.” Then he said a few more things about the place and its occupants, none of them complimentary. I finished my beer and went out to have a look at Lake Towers next door. The rooms faced noisy Portion Road instead of the lake. And the back of the building had no doors and only bathroom windows. Poor planning, I thought. There was some overgrown grass between the building and the fence that separated the property from the lake, but no patio or patio furniture back there to enjoy the view. I got in my car and drove away. I thought about it some. I’ve lived in this area for 30 years, I thought, and I’ve never heard anything derogatory about the occupants of Lake Towers. In fact, I’ve never heard anything about the place. I’ve never heard anything about any walkway being built around the lake, either. If the town really wanted to build a walkway, I’m guessing they would have found a way to do it by now. 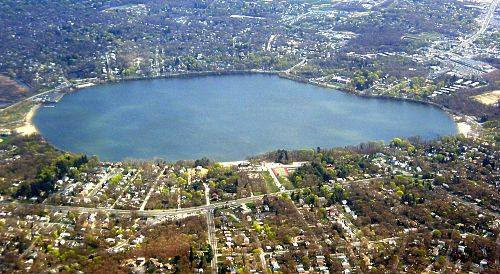 Even if there are a few holdouts along the lake, the town could easily detour the walkway around them. I mean, we’re not talking about building the Golden Gate Bridge here. I hope Lake Towers stays, I thought. Why should rich people be the only ones to live on exclusive waterfront property? Some rich people don’t appreciate the view from their properties any more than the occupants of Lake Towers seem to. Low-rent people should have the choice not to appreciate what they have just as much as rich landowners do. At least once in a while. You know, to even things out a bit. It seems only democratic. Sure, it might be a cockeyed view of democracy, but a cockeyed view is better than no view–and it’s free.